But there are several pool maintenance components to consider, as well, including choosing a water pump. Your first instinct may be to go with the least expensive two-speed pump. However, investing in a variable-speed pump now may help you save money over the life of your pool or hot tub. For a long time, a two-speed pump was one of the only options available for pools and hot tubs. Two-speed pumps offer two fixed speeds, which means they cannot be programmed to run at a unique speed. The problem with this method is that not every style of pool or hot tub works best with these two settings. Additionally, two-speed pumps consume a large amount of energy. In fact, induction motor pumps burn the same amount of electricity per month as the average household’s appliances and utilities combined. Once this energy waste was discovered, developers began looking for a more energy efficient alternative, and the variable-speed motor was born. Variable-speed pumps use permanent magnet motors, similar to those used in hybrid cars, for energy efficiency. The pumps also offer over 3,000 different speeds that can be changed to fit your pool and hot tub. Additionally, built-in diagnostics are included to protect the pump from overheating, freezing and voltage irregularities, and the system is much quieter than conventional two-speed pumps. Variable-speed pumps are designed around the knowledge that it takes less energy to move water slowly than to move water quickly. When less energy is used to pump water slowly, pool and hot tub owners save money on energy costs. Pumping water through pool and hot tub filters more slowly also causes less resistance from plumbing and accessories, which can result in less need for repairs as the equipment ages. Would you consider a variable-speed pump? 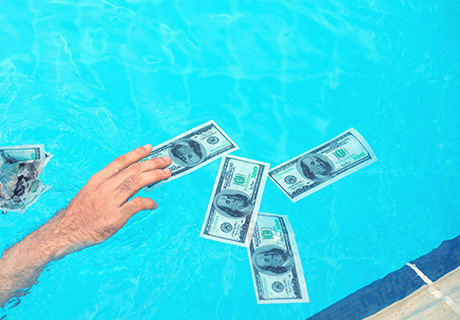 How do you save money on pool maintenance costs? Tell us about it in a comment below!